Infinity® replacement windows and doors are made from Ultrex fiberglass - a pultruded fiberglass material so strong and durable it is superior to other window materials. Best of all, it makes Infinity products virtually maintenance free. Our patented process starts with strong cables of glass that are saturated with specially compounded resins that are pulled through a heated die and cut with diamond-edge blades. Below are the steps Ultrex goes through from forming and curing all the way to the cutting stage. All of these steps create a remarkably durable material that outlasts and outperforms other window materials. 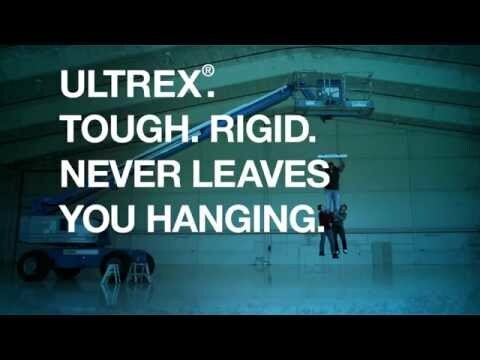 Ultrex is as strong as low carbon steel and 8x stronger than vinyl. It's so tough we have to use diamond-edge blades just to cut it to size. The strength of Ultrex translates into superior stability, long-term ease of operation, low-maintenance, and superior performance. Take a moment to look at the images below. The Infinity view is expanded — how? The superior strength of Ultrex also allows for a narrower window frame profile and more glass area than other replacement windows, giving you more daylight and better views. Ultrex resists the ravages of cold, heat, time and pressure to provide the most worry-free windows and doors available today. While vinyl can distort in extreme heat or streak and crack in the fluctuating temperatures, Infinity products offer the highest level of performance and are virtually maintenance-free. Ultrex has an extremely low thermal expansion rate, which keeps the window stable and weathertight, reducing the risk of seal failures and air leakage into your home. The low expansion of Ultrex means Infinity Windows resist sticking, swelling, and warping, providing easy operation for the life of the window. The low expansion of Ultrex means Infinity’s patented finish stays looking like new and is virtually maintenance free. It resists discoloring, warping, rotting, corrosion, denting, rust and doesn’t require sanding, scraping, or painting. Our patented, mechanically bonded finish is up to 3x thicker than competitive finishes. It provides superior resistance to scratching and UV degradation - even on darker colors. The Ultrex coating system is AAMA 624-10 verified meaning our commercial grade finish resists the harshest weather conditions mother nature offers; a claim our competitors can’t match. Infinity offers Stone White as our standard exterior color. Sierra, Cashmere, Pebble Gray, Bahama Brown, Bronze, and Ebony are available as options. Infinity offers Stone White as our standard interior color. Sierra and EverWood®, our stainable wood grain interior finish, are available as options.